It is hard to find time to do everything in a week. Dishes piling up daily in the sink. Laundry baskets starting to overflow. Meals that need to be made. Activities that the kids need to run to. Life can now get a little bit easier with the Shark ION ROBOT Vacuum. With the push of a button it will vacuum your house while you are busy all your other tasks. We all need this! Let me give you a little background about my household and then I’ll share all its cool features. I have 3 messy boys and a dog that sheds. My house is not very big with lots of stuff. My main floor is mostly hardwood, but there are rugs laying around. I was a bit worried about how the ROBOT would navigate all of this. My kids could not wait to open the box. A robot in our house? They were pretty excited. We first downloaded the app. This allows you to remotely control it via Wi-Fi…though you don’t need the app to work the vacuum. The app allows you to Turn it on from anywhere, tell it to go to the Dock so it will Recharge again, Schedule your weekly cleaning (love this! ), and even look at your History. Or we ask Alexa to turn it on too. Pretty techy! It runs on an ithium-ion battery that lasts for over an hour. I’ll admit I am pretty impressed. 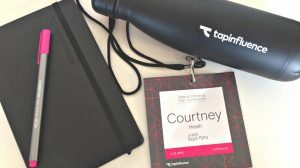 The smart sensors detect all objects really well and it backs out and spins until it finds a new route, even if it gets caught in a tight area. You can see the little brushes on the bottom sides come out to sweep along the walls. It picks up crumbs, dog hair and little bits of debris pretty well. It also has a detangling technology that lets the brushroll manage and untangle long hair, string, and fiber which is nice. The dust bin is not huge for collecting it all, but it does cram it in there pretty well and I just make sure to empty it after each use. The first time it went under our entertainment center I was like uh oh. I wasn’t sure it could fit and there is a rug right there too. It works beautifully! Goes under and back out, over the rug with ease. The dog is already immune to it…unless the ROBOT gets a little too close. hahaha. It also comes with separate BotBoundary Strips that allow you to mark off an area you don’t want your ROBOT to go. If you aren’t ready for “new techy gadgets” as my brother would say, the Shark Rotator Powered Lift Away Vacuum is great too. Read my post on it from last year. Find the Shark ION ROBOT Vacuum on Amazon – it has great reviews! 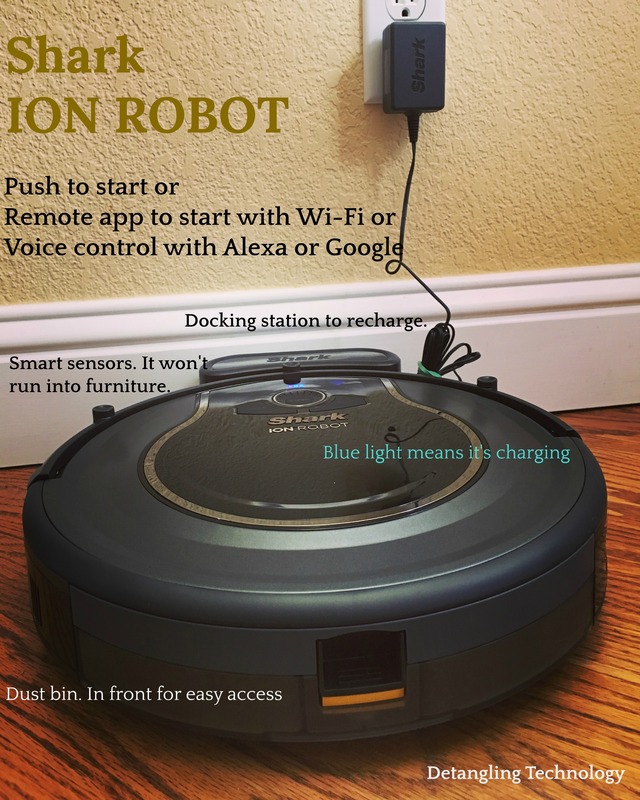 I partnered with Shark who sent me this ION ROBOT Vacuum for free. All opinions are my own. Amazon links are affiliate. This giveaway will end on Dec. 20, 2017 at midnight MST. Winners will be drawn via rafflecopter. Once a winner is drawn I will contact them and they will have 48 hours to reply before I draw a new winner. Giveaway is open to anyone in the US. You must be 18 years of age or older. Giveaway is not affiliated with Facebook & I release them of liability. Winner will be posted in the rafflecopter widget. Wow! This would be great to turn on and let it do the work while I take my daughter to therapy! I love that it captures short and long hair, dust, dander, and allergens. I have indoor pets and that would help me a lot! i would love a robot to clean my floors because i feel like i am sweeping everyday because of my dogs making a mess! Being able to schedule and cleaning would make it so easy to get those things done when baby is napping that I cannot get done! This would be so amazing to have thank you for the chance! Oh my gosh I would love to have this! I have to vacuum almost daily because of the dog hair, this is amazing! The Shark features can make life easier for me with no bending, lifting, or stooping. I've wanted a robotic vacuum for so long! The feature that I like best is that it vacuums for me. I have Rheumatoid Arthritis and at times find it difficult to move the vacuum around. This Shark robot would solve that problem. This would be absolutely amazing for our house! We have two husky/lab mixes, and 3 daughters so this would be really helpful! So much hair, haha! Wow, this would be great to pick up my dogs hair and I don't have stoop to pick up stuff. This will make vaccuming much easier and will save time. It would help same me a ton of time! Very strong suction to get even the finest hair from human and animal. Such a wondrous invention these robot vacuums. This would be a relief for my bad back!! The fact that I can schedule when the Shark cleans by using my phone is very helpful! shark makes a great vacume. I love their products. My last 2 have been from Shark. I absolutely have been wanting one of these so bad because I have a sheltie that sheds and it lives on the hardwood floor and carpet no matter how much I vacume. I love the voice control feature of it and that it senses areas that need to be cleaned. Anything that can help do some “damage control” between big vacuum days is fine by me! We’ve got shedding dogs and live in the desert...dirt and dust and hair galore. With my busy life, it would be fabulous to be able to schedule vacuuming to happen whether I'm home or not. Also the fact that the Shark cleans up pet hair is terrific. I have a bad back and really bad arthritis in my feet. It would help me not to have to push a vacuum. I really like that the vacuum can navigate area rugs. I like that you can control it remotely via Wi-Fi. It would be great not to have to push a vacuum back & forth. I love that the little brushes clean along the edges of walls! This would be so awesome to have! I have a hard time getting around and this would be so perfect for me. I have read the reviews and I love how well it works on wood floors and how good it is at picking up dirt and pet hair. I have pet parrots and their seed is always on the floor. This sounds like it would really work well for vacuuming up those too. It just sounds like an all around great product. I like the Self-cleaning Brushroll. I am a vacuum cleaner junkie. My friends make fun of me for having so many vacuums. Dirty floors give me aniexty! But I hate to vacuum, and have never wanted a robot vac until shark released one. I absolutely adore shark anything- their warranty is incredible and their products are top notch and blow the big D competitors vacs out of the water (which I’ve also owned). We have removed all the carpet in our homes and replaced it with vinyl plank flooring, so I’m constantly vacuuming up dog hair and Cheerios that would have ended up ground up in the carpet before. A shark would make my daily cleanups soooo much easier, and my toddler would get a kick out of it. The dogs...probably not so much. Now if they could just find a way to make the robo-vacs climb stairs! Have a vacuum robot to clean up all the pet fur would be a dream. I have 6 pets in the house and the fur is everywhere. I like the photo of your robot vacuum going under the furniture. Now that's my kind of cleaning! This would be awesome to pick up the every day dog hair and toddler crummies. It would sure make cleaning a lot easier and I wouldn't have to worry about having clean floors if company stops in unannounced. I would love not to have to carry the big, heavy canister vacuum around my house any more. I love that it has wifi so I don't even have to be home to program it. The fact that it's a robot - that feature alone - would be immensely helpful to me. I have several indoor cats and those little litter box trails of litter from their toes has me sweeping daily. I like that it can get into the corners, that would be really helpful! The Shark Ion Robot Vacuum would make my life so much easier, because I have Fibromyalgia and Fibrous Dysplasia, and it's so hard for me to use a big ole heavy vacuum, so this would definitely be a BIG benefit in my life! We live in a very dry dusty area and the dirt and dust from the dog and all the things he brings in never ends. This would certainly help with that. Just turning this on while i focus on my son will be awesome. Shark would make life so much easier for me, I homeschool and we have 2 dogs & a guinea pig so I vacuum everyday. Allergies and asthma it’s a must to vacuum so this would truly be a blessing and free time up for more family time! I love that it gets the edges of the carpet no more bending down with the hose and attachment to get the corners and the edges. Also my other favorite feature is I would not have to push the vacuum around the house. The Shark ION ROBOT 750 Vacuum would make my life easier by cleaning my floors for me so I could go do other things around the house. This would help me a lot because has some disability and this would help me with some of my cleaning. You had me at self-cleaning brush roll. I love how I can just set it and go! The Shark Ion Robot will take care of all the vacuuming for me! It's so cool I would LOVE to have one! The detangling feature ! This sounds amazing with my long Hair and two labs. Awesome feature. I have horrible allergies where we live, and with us living in a heavy tree and natural spring area allergens are constantly being tracked in. we also have three pets. this would help with all the fur too! We have a Bobsweep and have had nothing but problem after problem with it - sensors have busted not just once but twice and now one of the wheels is busted. They are fine with sending replacement parts (especially since I just got it for Christmas last year) but I still have to pay the sipping which I don't like at all! I'd love to win this one and see if it holds up any better! We have three cats and as of tomorrow will be back up to three dogs. The amount of pet fur we get is hard to keep up with, so having something like this would be a real godsend! I'd be curious to see how my dogs and cats react to it, too! These robot vacuums generally work well, and other than having to empty the receptacle often, it would be great to vacuum up the cat hair. The Shark Ion would make my life easier because I vacuum nearly every day due to messy kids, a dog and a cat. This would help my stepson who recently moved into a new apartment, and probably needs all the help he can get cleaning without taking up too much of his time. I am disabled and this would be wonderful for me! Would love to own one. I love that I can s chedule it to go on and off while I am at work/not home. it would make cleaning jobs at work lot faster and efficent. Having a Shark would help save time and to not having to sweep the floors everyday from dog hair and everything else. I have 3 dogs, 1 cat, 1 rat, and a bearded dragon...We could definitely make use of this thing! It is so handy. It does the vaccuming without even touching it. This would surely be a timesaver. It can be controlled by an app on my phone which makes it easy to operate. I can sit and do something else, like paying bills, while running it. This would help out so much with a dog and tons of long hair in our house. I don't think we can vacuum enough around here. Thank you! This would be a great gift for my 70 yeah old mom who also has COPD and becomes short of breath with activities such as vacuuming! I can schedule my vacuum time for when I need it done, and it has a long life battery to get all my vacuuming done in no time. I hate vacuuming and this would make it so much easier! I would love one , my dog shreds all year long, looks like this could handle it. I have always, always wanted to have a robot vacuum! When my dog eats she scatters kibbles EVERYWHERE...like, literally, everywhere. It's maddening. This little guy would help keeps those controlled. Also, dog hair gets everywhere too, so I love that the brushroll is self-cleaning and says it can handle short and long hair. So cool! Shark Ion Robot Vacuum would help with my allergies! Thank you for the chance to win! OH MY GOSH I've always wanted one of these! I do have to wonder how these things clean in the corners... but other than that, I think they are great! We would luv to win the Shark robot. With cat fur everywhere and being disabled, this would be purrfect. And our house is already filled with Shark products, so we're familiar with the quality. I care for my 15 month old granddaughter & in having COPD, this gadget would make for one happy girl! Thank you for the great review & for the giveaway! Merry Christmas! I have been dreaming of one of these for a while now. Would love to get chores done without actually having to do anything. At the age of 85 I cannot do housecleaning like I used to do. Winning this ION ROBOT would be such a blessing to me. thank you for the giveaway. I want to make life easier for my Mom in Law. Her vacuum is heavy and tires her out. I have a robotic vacuum I adore and would like one for her. Shark can make your life easier by vacuuming for you and you can use Alexa or Google to tell the vacuum when to start or you can use your smart phone app to start it even when you are not home. It also has side brushes that sweep out corners and get close to the wall so you don't have to sweep prior to vacuuming. This would be great for us because we have folks with allergies in our house and even though we try to keep dust at a minimum. The Shark Ion Robot would make it easier to keep the kitchen clean and get hard to reach areas underneath the furniture. Life would be so much easier with this! I have 2 dogs, vinyl, tile, and hardwood floors, and a two year old. There are dust bunnies of dog hair everywhere!! The Shark would make life easier for me by saving me energy, having a chronic illness keeps me extremely tired. Without barely lifting a finger my house would still be clean. I love that you can schedule a cleaning that is so cool I didn't know it did that. I have 2 dogs. This would work great for the dog fur! I would loooove this Shark robot vacuum. I love the ability to schedule it from your smartphone. I also love that it has dual spinning side brushes to pull in debris from corners and edges -- that is where I always have dust bunnies! Thank you. I have RA, so anything hands free would help. Also to keep up on the pet hair and the stuff the kids drag in, would be a wonderful feature. I like the smart sensor. The Shark features would make life easier for me because I have Fibromyalgia and there are times that I can not move much because of the pain I go through so this would help so much. Plus with 2 cats there is hair all the time. Thanks for the giveaway. I have several kids and pets which means vacuuming daily. This would be a dream with helping me keep up on the fur and messes! I love that it's voice activated also! This sure would make my life easier because I wouldn't have to vacuum every day to get up the dog and cat fur. They sure do shed a lot especially at this time of the year. I love that it has an app and that you can schedule the times for it run. I've been wanting a robotic vacuum for a while now, it'd be so fun to win. They're so awesome! The Shark features would make life easier for me by doing all the work for me. I won't have to vacuum again! I have a lot of fur babies and it would really help get rid of the cat hair. Oh man! I would love to give this to my parents for Christmas! We invade with our 2 dogs and kids and wreck their house. I'd love to let this clean up after we leave. I'd love to have one of these! It would make my cleaning easier by saving me time on vacuuming! 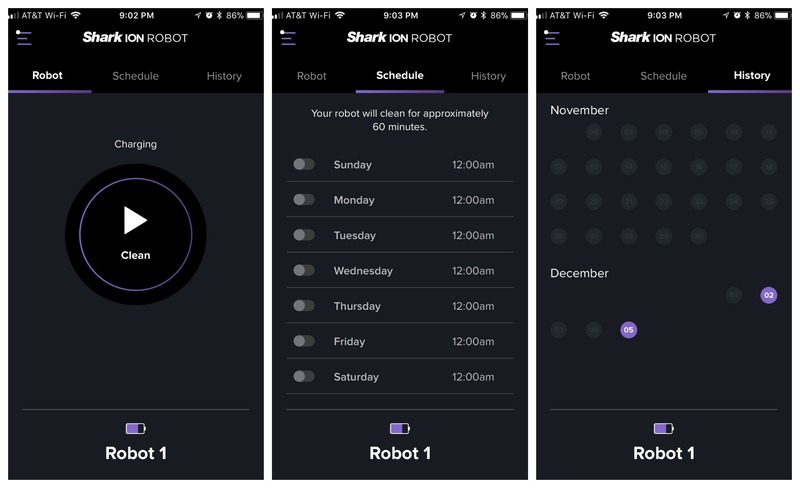 I like that you can schedule cleaning from anywhere with the ‘Shark ION ROBOT’ app on your iPhone or Android :) I don't even have to be home to vacuum my floors ! The Shark feature of of a schedule would be a huge help because I would be able to get to clean up when nobody is home and come home to a clean house. I would have clean floors and carpets cause I cant vaccum or sweep or twist cause of failed back surgery and rheumatoid arthritis . This would be awesome. I would love a Robot Vacuum. Make sweeping so much easier on my back. being able to control the vacuum by app would be helpful. also, since it can collect short and long hairs it will clean up after me and the pets! This would make life easier. I have 3 dogs and live in a very dusty area. I feel like I can't keep my house clean enough. This is number one on my Christmas list this year (hint, hint hubby!!) I have two messy boys and I am constantly sweeping so this would be a big help on my daily chore tasks! I have a bad back so I love that it does the work for you without bending to sweep up the mess! We have 2 dogs and the pet hair is endless- I feel like I’m always vacuuming! I’d love to have this so I could set it to fun during the day and save me some time!! thank you for the giveaway opportunity xo it would be nice to have it working downstairs while I'm working upstairs. We might tear this puppy up, depending on how sensitive it is. Or maybe the bot might encourage us to pick up a bit more. With 3 children in my home this could be a lifesaver to me! The Shark Ion Robot Vacuum features are all great. My favorite is the Long-life lithium-ion battery which allows for over an hour of cleaning time. To be able to clean your floors without you even being in the room is priceless. I have wondered if it misses spots on the carpet. I like the Dual spinning side brushes for the corners and sides. I always miss half of it. We have 3 dogs and 4 cats so thats a lot of pet hair and cat food on my floor each day. They all leave bits of dried foods on the floor so this would help keep it clean especially in my kitchen . ALL the features would make my life easier! We have two dogs and two cats...cat hair is everywhere! We get clouds of it in the corner! This would be so helpful with two kids and a dog. LOOKS LIKE EXACTLY WHAT I NEED FOR CHRISTMAS! This would save so much time so I could spend less cleaning and more time with family. I have tremors, so it is impossible to use a dustpan. :( So this would really help to keep my floors clean. This would be great for all the pet hair. Our dog sheds so much - we NEED this! I have 2 cats and if this Shark Robot can help make my cleaning life a little better than I'm all about it! Happy Holidays everyone! It can make life so easier for my mother this is who I would gift it to when she has company over and get do a quick spin around on the carpet and it'd be so easier for her and her life. She is such a busy mom and is always on the go. Our house needs constant vacuuming. This would help free up time for us. Our home is the go-to place for family and friends. Having this shark ion robot vacuum would save me so much work keeping the floors clean. I'd love to have this incredible vacuum run every night so I could wake up to clean floors. I have new beautiful gray carpeting and I need a good vacuum to keep it clean and like new! It would so much help no more worries to be pushing back and forth and keep my home clean and fresh for my family. Thanks for the wonderful chance :) very generous. Lifesaver would be to use it throughout the week since we are a busy family with 4 boys. my 2 dogs shed like crazy. Interesting to see if this thing can do the job!! This would be a terrific help cleaning up dog hair and dirt -- with 3 dogs it's a constant battle. Vacuuming is difficult for me because of a disability, so this would make things so much easier. It would help make my life easier by picking up all the pet hair on my carpets. I have wanted the Shark ION since I first saw it. Between a 6-year-old Granddaughter, my Mom who drops everything, the dog and my husband. The Shark will have it's work cut OUT for it!! Thank you so much for the chance!! This would save me so much time! :) My dream vacuum! It would make my life easier because I wouldn't have to think about vacuuming all of the time! We have a dog that sheds all year round! It would be so nice to just push a button and watch the vacuum go. I have some health problems and it is hard for me to vacuum with our regular one, so this would be awesome! I love that it can fit under the TV stand. I also love that it can clean all the kiddo messes so I'm not sweeping a million times a day. The feature I like the most is that you can schedule or start cleaning from anywhere and you and use your cellphone to do it. Plus it can also be voice controlled with Amazon Alexa & Google Home. Major time saver and easy to use! The vacuum is commanded by Alexa. I don't have to push a button, to turn on a vacuum. I just have to ask Alexa. Yes. The voice control would help a lot. I think my favorite part is the self cleaning brushroll. How fantastic is that feature!?!?! It would reduce the amount of sweeping required to stay free of pet hair. It will vacuum all by itself, and I won't have to! The features are awesome. Every one would hep me since I can no longer vacuum. Two major back surgeries in 7 months, OUCH! The Shark ION ROBOT Vacuum would be a blessing to have right now. I suffer from many allergies as well as an auto immune condition that makes running a vacuum very challenging. This vacuum could save me time cleaning. While I'm dusting, it can be doing it's thing. How can the Shark features make life easier for you? I don't have to stand or bend as much. I like the app to start it as I'm sure I would forget too start it on my way out the door each morning! Pets+<3+ Allergies= I desperately need all the help I can get! I have really been wanting one of these! What a great prize! I've had my eye on this for a while. Everyone can use this! Have been looking at one of these but wondered if it could navigate all the clutter. My two boys are wonderful, but very messy. They leave crumbs with every meal. Would love to have help cleaning my floors! I love that it’s Self-cleaning Brushroll captures short and long hair, dust, dander, and allergens to prevent everyday buildup in your home. We have too much clutter to try this out, but I would love it for my mom whose vision is failing. Floors that are clean when I get home would be so nice! It can be so helpful to have around the house because you can start it right from your phone and be helpful when i have busy days. The Shark features can make life easier for me with no bending, lifting, or stooping. I like that I can be doing other activities while my floor is being cleaned. I have a dog that sheds hair like water! I brush him every day and even in the Winter he sheds! I'm paralyzed and can't clean house like it should be cleaned so this vacuum would be a HUGE help to me! I am embarrassed by all the dog hair in the hallway and on my rugs. I would love this to help with keeping the dog hair up from our hardwood floors! To be able to schedule it would be awesome! A lot of times I'm just so busy, so this would make it much easier to have it scheduled ahead of time. This would be great to help keep the floor cleans for my baby who is learning to crawl! Less dog hair would make my life much easier (& happier)! I’ve had a smart robot vacuum on my wishlist for a while now. To be able to use my little bit of kid downtime to sit with a cup of coffee instead of sweeping would be fantastic. #Dreaming #MomLife #DoesItDoDishesToo? With 5 kids and 2 pets in the house, the fact that I can push the clean button (from the unit OR my phone) and let the ION do the work is amazing! We have pets so that it works well on dust dander and fur is great! Also, the start from anywhere using the app is perfect-I can be at work or on my way home and my floors will be clean when I arrive. I am afraid my dogs would be terrified. But it might give them something to do while we are at work. I would give this to my daughter who could spend more time studying at college while the Shark cleaned her floor. I love that it can vacuum both carpet and hardwood. I hate having to switch attachments on my current vacuum when changing rooms. I have seen these work in person, and they are amazing. I never thought a "robot" could clean as well as I can, but it really does work. That is my favorite feature, that it works! I would love to have one and let it do it’s thing on my floors. It would be great to not have to sweep and vacuum constantly. I can’t believe how many crumbs wind up on my kitchen floor every day. 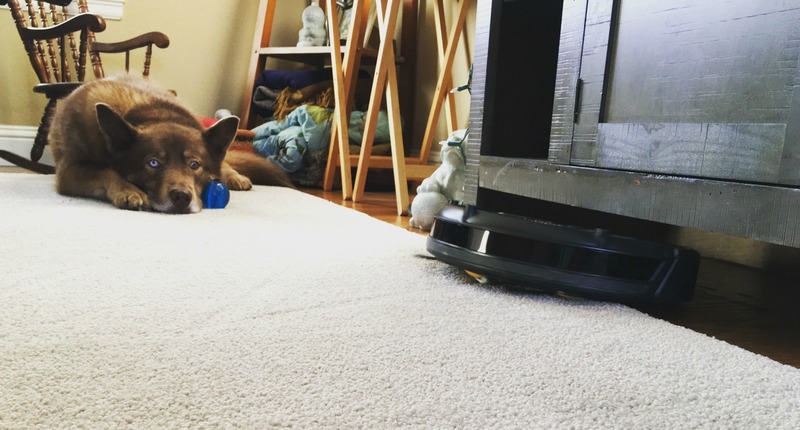 The ION Robot would make cleaning up after my dog so much easier. I really like that it is wifi enabled. I wanted one for awhile, but didn't think it'd be able to do the job my vacuum does. A friend of mine got one and loves it! My vacuum works, but the cord hook broke. I have cord all over the place! This would be great! The Shark features can make life easier for me because this would help me clean the house quicker so I can enjoy more time with family leaving me with more time for what's important. I love that I can also control it from my smart device to schedule, start, pause, or cancel cleaning cycles from anywhere at any time. I would love to own a Shark ION ROBOT Vacuum! Because I don't have a good reliable vaccum! This would be so amazing! I have a newly crawling 6 month old, 2 older children that are constantly coming inside and outside, and a dog who tracks in everything! So you can imagine how often I am cleaning my floors. I love that this could lessen my load and love its mapping abilities! Shark had me at "Self-cleaning Brushroll . . . " I'd love to see how this will work. I have doubts that my dog, cat and people hair mess of a house can be served well by such a small device, though. It's the reason I've never gotten one. This will help out especially during the winter months because the dust builds up so quickly from our heating system. I am also a big fan of Shark products and would highly enjoy owning one. I love that you can schedule cleanings for it! That would be amazing to let it run while I am not home. Doing some chores while running errands is the perfect mom multi-task! I have always wanted to buy one, but not sure how it will be doing in my house. It will be good to try one. I like the voice activation. This is sooooo convenient. i have two toddler boys, who magically manage to leave crumbs everywhere constantly. this would be amazing! I love that i can have it start, even when im not home. I love that it cleans along walls and corners. I have a long haired cat who constantly sheds so I think this would be perfect. 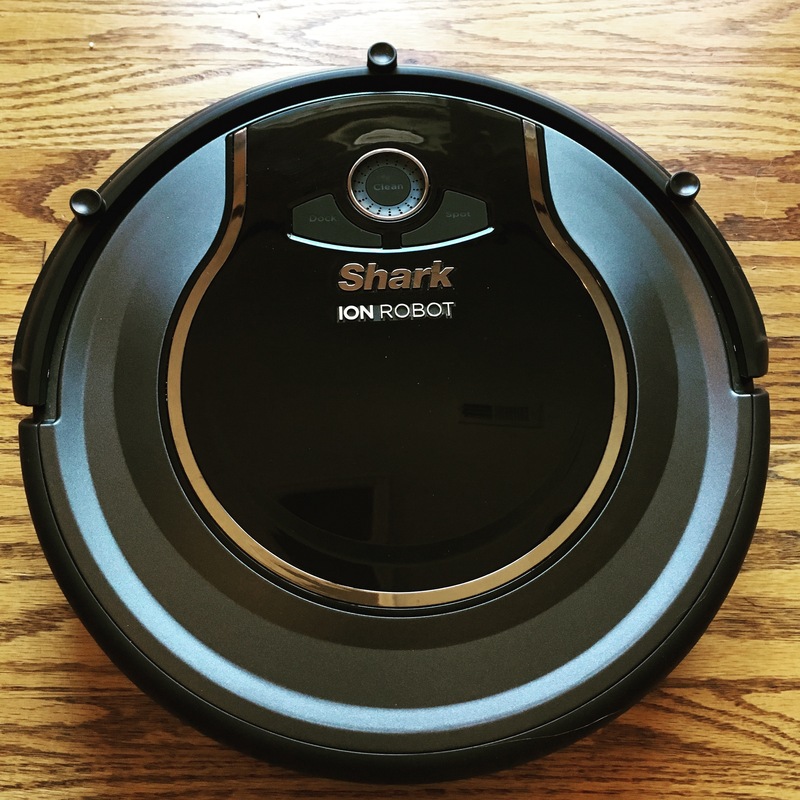 The Shark Ion Robot vacuum would life so much easier for me as a busy mom of three! It is crazy dusty where I live and I am constantly finding myself sweeping after my kids, it would be so handy to have this to help with the in between cleaning. It would make my life so much easier but doing the vacuuming. I need all the help I can get. Years ago, I had a Roomba, which I liked a lot. This Shark ION robotic vacuum has a lot of updated features that would be a big improvement on my early model, like being able to control it from an app. The self-cleaning Brushroll would be really useful here, with our two dogs shedding all over the house. I like that it can pull dirt from edges with it's brushes. That's one thing that's definitely important! Long-life lithium-ion battery allows for over an hour of cleaning time allows me no interruptions of deep cleaning my home. I have a couple of kitties who love laying on my living room rug...and you can tell exactly where because there are fur piles just after a day! This would be so helpful to keep them picked up! Hair and Fur is always an issue on the floor so I love that the Self-cleaning Brushroll captures short and long hair! This would be awesome for my cats shedding! I am pregnant and due in a few days and winning this amazing Shark ION ROBOT Vacuum will drastically change my life since I don't have to do it myself and bend over all the time. Thanks for the chance. Its' automatic features would make managing pet hair in our home so much easier as it seems to be an eternal battle! 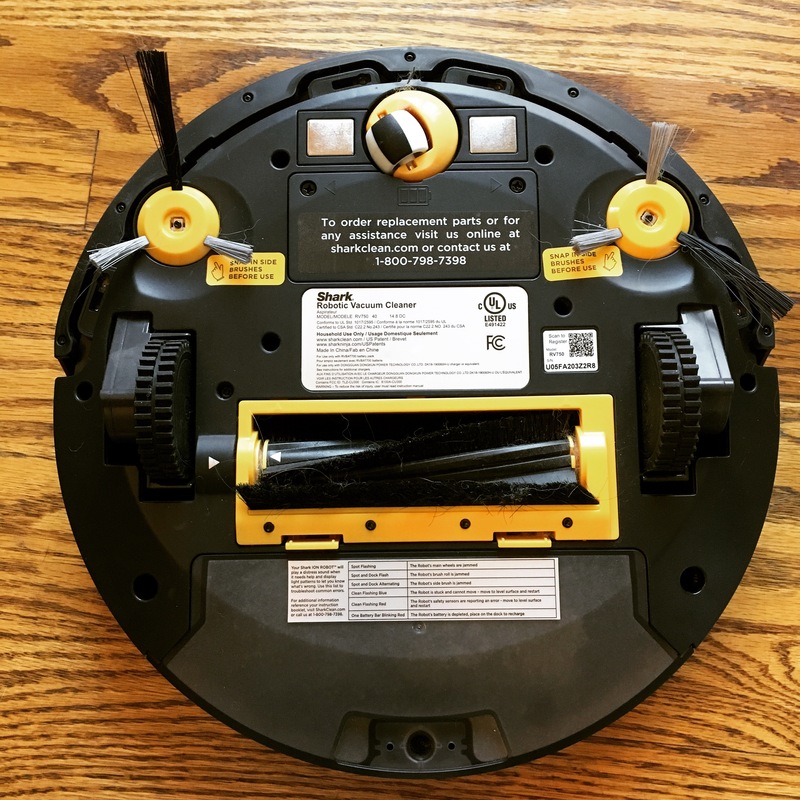 I have a dog and two very furry cats, having a little robot vacuum running around taking care of that with it's self cleaning brushroll would make my life tons easier! It's so cool that you can control it from anywhere with the app too! With the pets and young babies, this would be super helpful! I would love to have this shark Robot. It could help me to sweep under the bed and the furniture. This would be wonderful to have. This would be wonderful to have. Having all wood floors which I love but there is sweeping/vacuuming then mopping. This would eliminate one of my steps that I would think wonderful. Thanks you for this opportunity. And I want to say a BIG BIG thank you for a short sweet entry form. I would use it to help me manage the mess my twins make whenever they are doing arts and crafts. Which is every single day. I end up with glitter everywhere. We have a golden retriever that sheds like crazy and this would really help. I'd have a lot more time in my day if I had to vacuum less. The fact that it feels like there are just not enough hours in the day and even if there were I have more precious/important things to do besides housework, however, I DO love a clean and lovely looking apt. so The Shark Ion Robot Vacuum would be perfect for me. It would also be a godsend when my arthritis etc is acting up. It would be SO helpful keeping little messes from our cat, our cockatiel bird and our grandson picked up too. We seriously NEED a new vacuum besides all that. We had a Dyson Ball for the past 10 yrs and it has served us quite well, but it's seen much better days and is starting to need too frequent of a repairs and even then not working as well as it use to, so we've been talking about how it's time to replace it, but just haven't been able to afford to do so just yet. Winning this would be such a blessing and fill a big want and a big need too! Thanks for the chance. I love the fact that I can schedule a time for the Shark to vacuum! It would help sweep up hair, pet dander, and dirt on a daily basis. I love that it can be voiced controlled and that it has sensors to navigate the area. I have wood floors throughout my house and a cat and dog who both shed horribly. I would love to have a Shark Ion Robot Vacuum to help me keep my floors clean. I have arthritis in my knees, spine, ankles, wrists and hands so this would help me so much. Vacuuming is pretty difficult for me most days! I love that you can start the cleaning anytime from anywhere by an app on your phone. With three bulldogs, i love teh control and waiting until they are all asleep in their kennels. For me, the ability to schedule or start cleaning from anywhere via iPhone or Android is one of the best features of the Shark Ion Robot vacuum! I like that the self-cleaning brushroll captures short and long hair, dust, dander, and allergens all in one shot.